At the moment, gas prices are down, but the value of The Diesel is on the rise. Maybe the unique elevated start did make a difference tonight, as Yoshimura Suzuki's Blake Baggett, not known as a holeshot artist, grabbed the holeshot in the main event. He would quickly deal with heat from Red Bull KTM's Ryan Dungey and the Team Honda duo of Cole Seely and Trey Canard, and they were fired up. Baggett did a good job fending them off until Dungey managed to dive underneath in the first turn and then finish him off with another inside in the sand--Baggett was so hard on the binders that his rear wheel came off the ground down the start straight, but Dungey still managed to get underneath him. 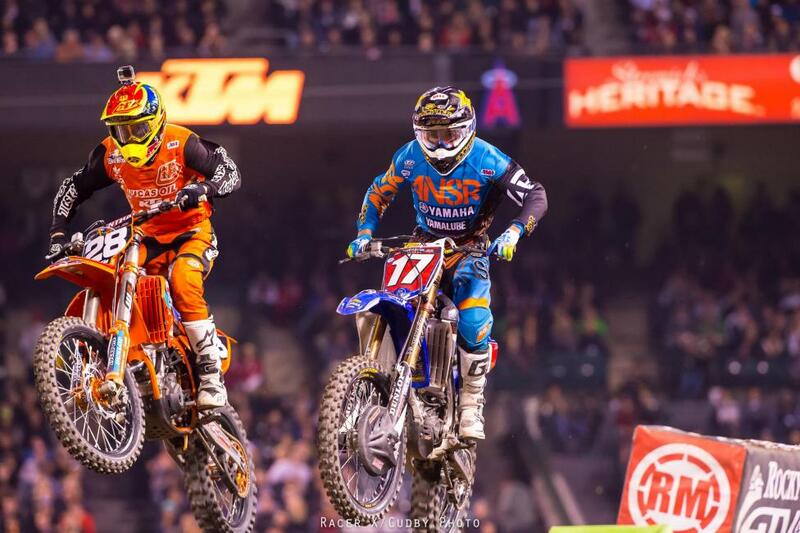 Then Seely and Canard would fight their way past Baggett, as well. 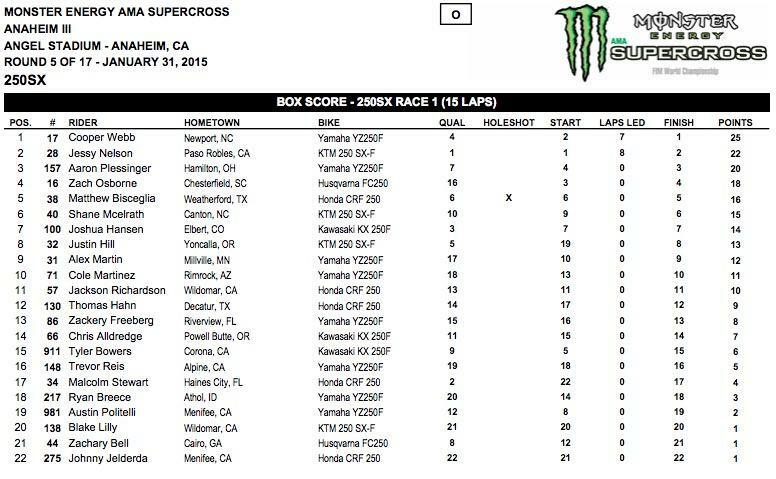 Though Blake Baggett (4) rode his best race of the season, Ryan Dungey (5) was simply on rails all day today. GEICO Honda's Eli Tomac had a good start but got shuffled around in the first few turns, he found himself chasing rival Ken Roczen, on a Soaring Eagle Casino/Jimmy John's RCH Suzuki. Roczen crashed out of the points lead last week, and didn't look quite as sharp this time as he did while winning the previous two Anaheim rounds. Tomac took a few stabs at passig him, then Roczen got through Baggett and pulled away for a lap until Tomac got Baggett, as well. While they battled for fourth, Canard made a run on his teammate Seely for second until he washed his front end out in the sand and went down. 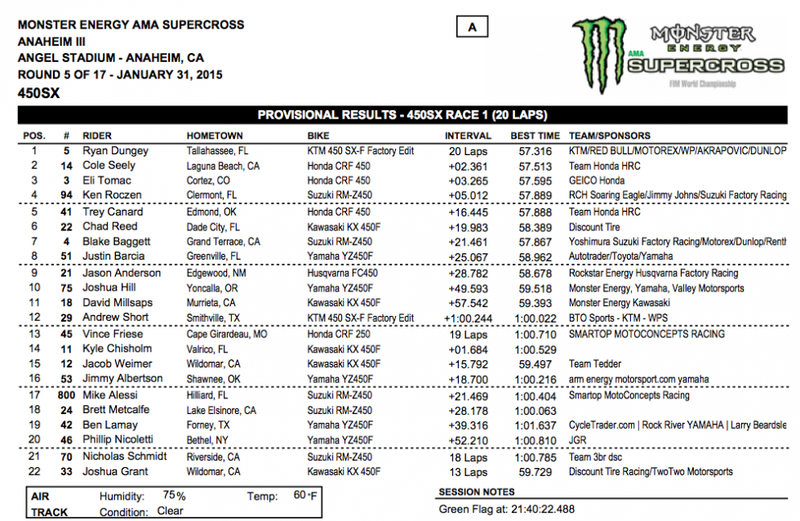 Roczen and Tomac slipped past before Canard, last week's winner, could recover. This set up a late-race dash between Seely, Roczen and Tomac for second, third and fourth, while Dungey rolled away in the lead. On the last lap, Tomac finally found a small opening and drove it in hard on Roczen to swipe third. He gave Seely a look, too, but couldn't make it happen. 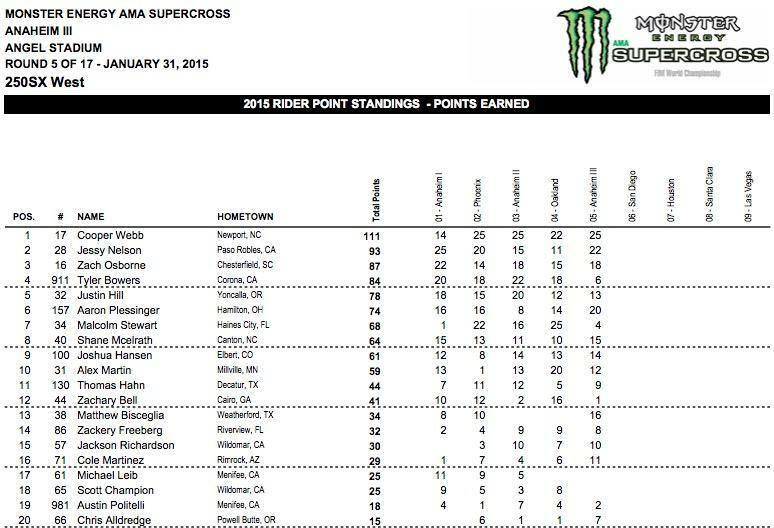 Seely, the full-time 450SX rookie, snagged a career-best second, ahead of Tomac and Roczen. 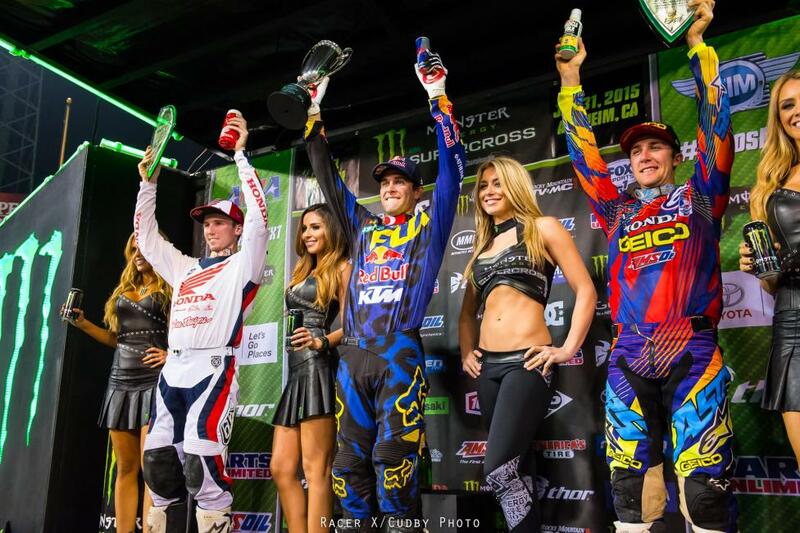 Canard recovered for fifth, while Chad Reed overcame a terrible start on his Discount Tire/TwoTwo Kawasaki for sixth. 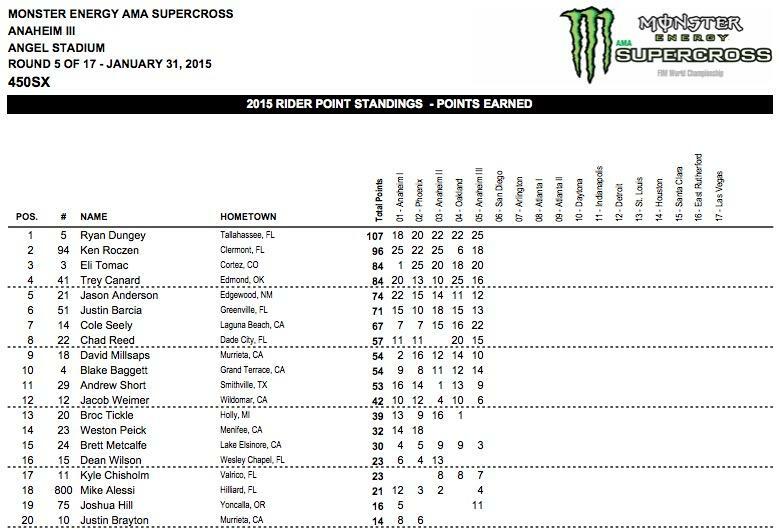 Baggett was seventh ahead of Autotrader.com/Toyota JGR Yamaha's Justin Barcia, Rockstar Energy Husqvarna's Jason Anderson, and Valli Yamaha's Josh Hill. 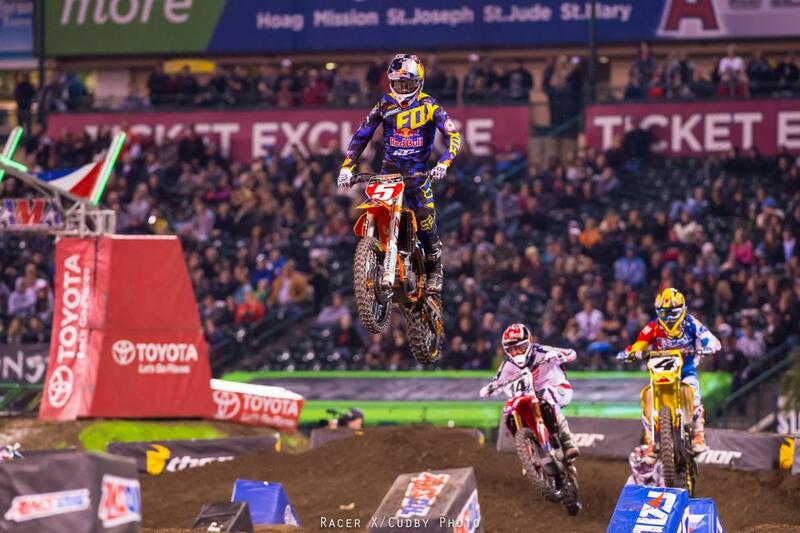 While he wasn't involved in most of the battles, Dungey was the star of the evening. He looked visibly faster at Anaheim 2 compared to Anaheim 1, and continued that upward climb at this round by taking the fastest qualifying laps, and winning his heat and the main event. He's also extended his points lead to 11 over Roczen. Dungey has been getting better as the season unfolds. Matt Bisceglia initially holeshot the 250SX main event and held on to the lead for a few laps before feeling the heat from Webb. Webb got Bisceglia for lead through the inside of the sandy bowl turn, but a red flag waved shortly after. Red flags are typically reserved when a rider requires serious medical attention, but this one ended the race due to a faulty starting gate. Zach Osborne waved his hand and looked around for the officials upon the gate failure. It took officials five laps to determine that the gate was faulty. The riders lined back up on the starting gate for a restart. 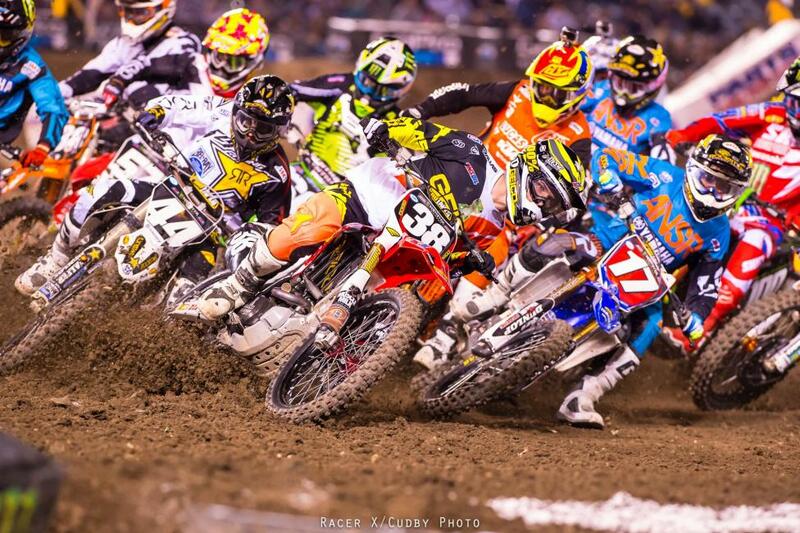 Jessy Nelson took the holeshot the next time around. Webb once again followed up the lead rider, though it took a little longer to make the move into first place. Nelson didn’t take it lying down, though. He came up on the inside of Webb a few corners later and checked up, but Webb predicted the move, checked up as well, and dove to the inside of Nelson. It was all Webb’s race from there. 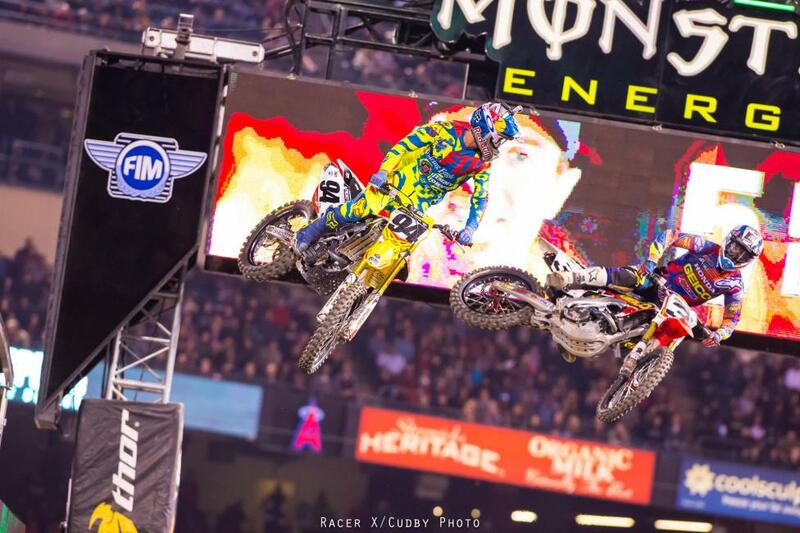 As Webb and Nelson battled for the lead, Zach Osborne and Aaron Plessinger were simultaneously battling for third. Plessinger was all over Osborne for several laps and was finally able to make something stick to secure the first professional podium of his career. Cooper Webb extends his point lead heading into San Diego.